Raspberry Beetle grubs cause serious damage to raspberries, blackberries and other cane fruits. Damaged ripe berries have greyish-brown dried up patches at the stalk end. A brownish-white grub, up to 8mm (about1/4in) long, may be found inside the fruits. 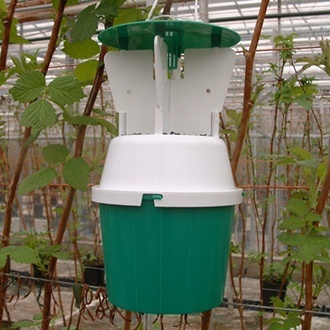 Adult male and female beetles are trapped before the crop flowers which may help reduce infestation levels. Contains one trap and one lure.